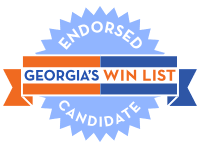 Georgia’s WIN List is proud to endorse Shelly Hutchinson for House District 107, who has lived in Gwinnett County for more than twenty years. She and her husband raised two children, have grown a highly successful business and developed strong community ties in the district. She is the founder and director of the Social Empowerment Center, a full-service mental health and social service agency with more than 80 employees serving an 11 county area, which provides quality support to at-risk adults and children. She has long been an advocate for fair and effective mental health policies and programs across Georgia. With a Bachelors of Arts from Lousiana State and a Master’s degree in Social Work from the University of Georgia, she founded the center 15 years ago and was recently honored for her business acumen and the rapid growth of her agency by the University of Georgia. Shelly teaches as an adjunct instructor at the University of Georgia both in Athens and Lawrenceville and is Chairperson for Mental Health Local Interagency Planning Teams in Gwinnett and surrounding counties. Her experience as a social worker, businesswoman and past employee of the Georgia Department of Family and Children Service gives her a unique skill set to not only represent her district well, but also to serve as a knowledgeable resource when fellow legislators discuss the role of mental health in gun violence, Georgia’s growing opioid crisis, and other matters of public policy concerning the state’s network of social services. To follow candidate activities more closely, make a donation or volunteer, contact the Shelly Hutchinson for House District 107 campaign below. Georgia women like Shelly are making history in this midterm election cycle as they run for seats long held by Republicans. With women in record numbers on the ballot this year, WIN List needs your help to elect these women and train the candidates we want to see on the ballot in 2020 and beyond.